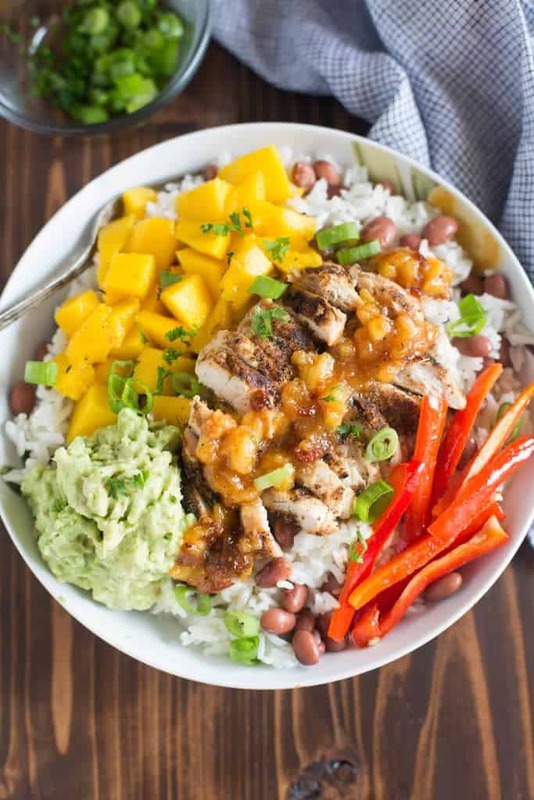 These delicious Caribbean Jerk Chicken Bowls start with a layer of coconut rice and red beans topped with jerk seasoned chicken, mangos, mashed avocado and a sweet and spicy pineapple sauce. I love it when a simple idea turns into a masterpiece dinner! 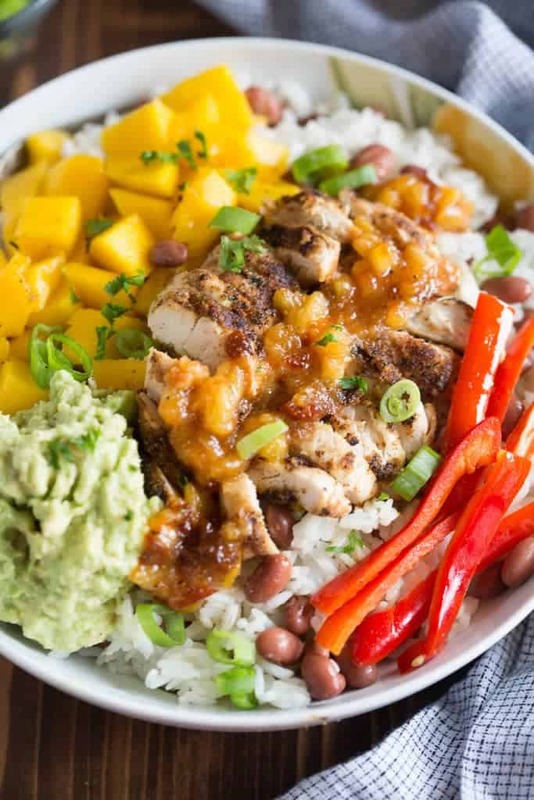 I love adding jerk seasoning to meat for a fun and different flavor, and I’ve been wanting to make some sort of Caribbean jerk chicken bowl for a while. I’m such a huge fan of all-in-one dinner bowls that incorporate a protein, rice or pasta, and veggies in one bowl for a gorgrous and well-rounded meal. 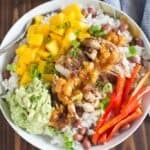 Two of my favorites–especially during the spring and summer–are these Grilled Hawaiian Chicken Teriyaki Bowls and BBQ Ranch Grilled Chicken and Veggie Bowls . Both are fabulous! For these bowls you can use regular cooked white rice, or make some yummy coconut rice and red beans. I used my instant pot to make the rice- I’m a little obsessed with how well it cooks rice and how easy the process is. Meanwhile, make the sauce. It’s super simple and has a great sweet and spicy flavor. Season the chicken with jerk seasoning (you can use store-bought, or make your own!) and grill it or cook it in a skillet. Mash an avocado. Chop some mango and bell pepper. Layer everything over your rice, and dig in! So many great flavors that compliment each other well. Combine the pineapple sauce ingredients in a small saucepan over medium-low heat. Simmer for 5-10 minutes. Remove from heat and set aside. Cook rice according to package instructions. I use plain, long-grain white rice if I'm in a hurry, or coconut rice if I have time to go the extra mile 🙂 . When the timer goes off for the rice, add the red beans to the pot and fluffy everything with a fork to toss it all together. Return the lid to keep it warm while you cook the chicken. Season chicken breasts all over with jerk seasoning. Add olive oil to a large skillet over medium heat. Add chicken and cook for 3-4 minutes on each side, flipping once, until cooked through. During the last 2 minutes or so of cooking, add the red bell peppers to the pan to saute. Spoon rice and red beans into bowls. Add chicken and some red bell pepper, a scoop of mashed avocado, and a spoonful of fresh mango. Spoon a little of the pineapple sauce on top. Enjoy! Love, love, love this recipe! The sauce itself gets rave reviews all around. 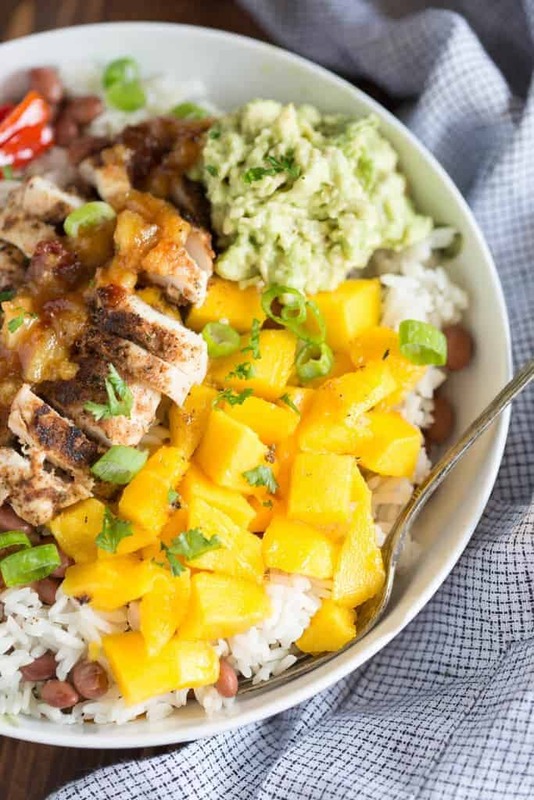 Allergic to mango, but love this recipe. Any ideas for mango substitute? You could use pineapple instead! Another big win in my house! We did the pineapple sub for mango since Im allergic and it was amazing! Thank you also for your simple and easy to follow coconut rice recipe! I have always been scared to make rice in the past lol this was super yummy!